The GT Battery Isolator from CARTEK is a very small and highly reliable alternative to the traditional mechanical master-switch and has been designed to overcome all of the problems and restrictions associated with mechanical and electro/mechanical safety cut-outs. When fitted to a race car our Solid State Battery Isolator simultaneously isolates the battery and kills the engine immediately when triggered in accordance with FiA safety regulations. This system has been designed to simplify installation thereby saving time and reducing build costs. The Cartek Battery Isolator GT provides two functions. The first is to disconnect the Battery from all Electrical Circuits. The second is to kill the engine. 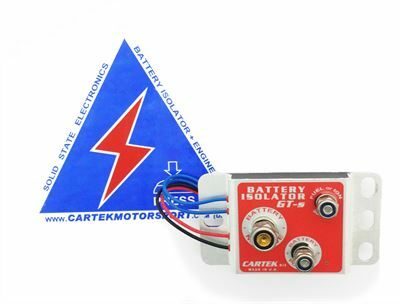 The Cartek Battery Isolator GT kills the engine by taking in a fixed 12v input and sending a 12v output that would power your Ignition or ECU. When the negative side of the battery has been disconnected it will also cut the 12v output powering your Ignition or ECU. This will kill the engine. The Cartek Battery Isolator GT comes with built in alternator run down protection meaning no extra wiring and no extra components. Battery negative terminal: M8 stud. Positive power terminals: M6 stud. Positive power switching current: 40A.